I have a friend that unfortunately is dealing with cancer. It's a long terrible story that started years ago. Recently, she started chemo, I guess at this point it wasn't that recent. 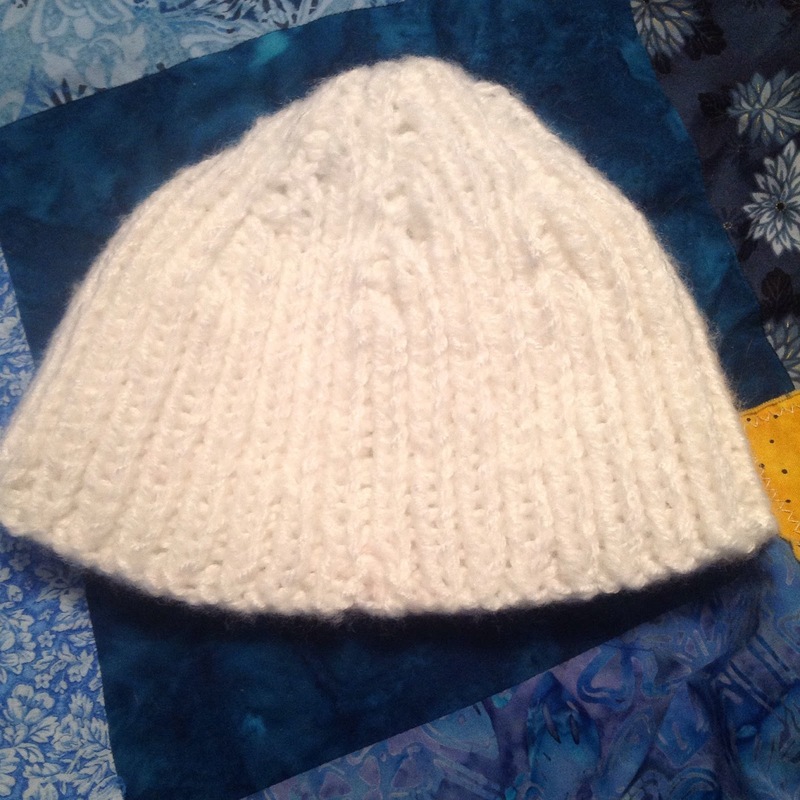 When she first started, I said that I would make a hat for her. She wanted it to be purple. I agreed. The next time I saw her a few months later, I had not made a hat and she was wearing one, a purple one to be exact. Another friend made one for her. She said I could make her a white hat. It moved to the top of my to do list because my slow ways had caused me to miss out. I kept thinking that I need to get to the fabric store, I even had a gift card! Last week, as I drove by the fabric store to get something at a big box store, I lamented that I had indeed forgot to make time to stop by there yet again and did not have my gift card with me. On to the big box store I went. We picked up all the things we needed and wandered over to the toy section to see if they had something that Hannah was looking for. She's in that wonderful age of still enjoying some toys but also interested in older things. It's a fine line, but that's another blog for another day. Well, at the end of the toy section was a row of clearance items. I attribute my love of the clearance aisle to my mother. I couldn't say no. We walked down the aisle, not looking for anything in particular and everything in general. And there at the end of the row was a skein of white yarn. The label had fallen off, the clearance sticker was its only dressing. I picked it up and put it in my buggy. I brought it home and there it sat until the weekend and I cast on one evening. And I began to knit. It was a pattern that I've made several times before. It's probably my most knitted pattern ever, go to pattern if you will. So much so that the next evening I was done with it. Wove the ends in and it was finished. I still have to get it to my friend, but I thought I'd share with you some of the lessons I learned along the way. God is not going to wait for your disobedient heart to come around with time sensitive matters, someone else will gladly get the job done. And you're the one that misses out. The one who could have given a gift is truly the one that misses out on seeing God's blessings and how the work of His hands never fails. God is always going to give you the tools, gifts, resources you need to do what is asked of you. Not once in my life has God said to go and then left me in the dark. Even in the simplest of tasks of buying a skein of yarn, God provided a way in an unexpected place within my means. Sometimes it's easier to see this in the small stuff, but it's true in the big stuff. Maybe even more so in the big stuff. We too often build things up to larger than they really are. We let the idea of them overwhelm us to inaction and then are surprised by how little time obedience actually takes. It's probably related to tithing and how we wonder if we can actually live on 90% of our income when the truth is it's easier to live on the 90% than the 100%. God helps us through the work that He has appointed us to. He does things that are not humanly possible and we can be used to do them, if we say yes. I'm not exactly sure why I keep forgetting all these little lessons, but I do know that I'm thankful that God is willing to walk with me through them again and again.